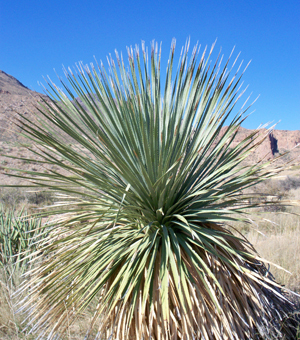 A spherical clump with spiky, bluish-gray leaves that have stiff teeth along the edges. Leaves slowly form a trunk 3' tall, which is covered with a dried, drooping shag of old leaves. The base of each leaf broadens where it joins the trunk to form a long-handled 'Spoon'. Eventually produces blooms on a 9' to 15' spike. Fortunately, bloom does not spell the end of the plant as it does with agaves.